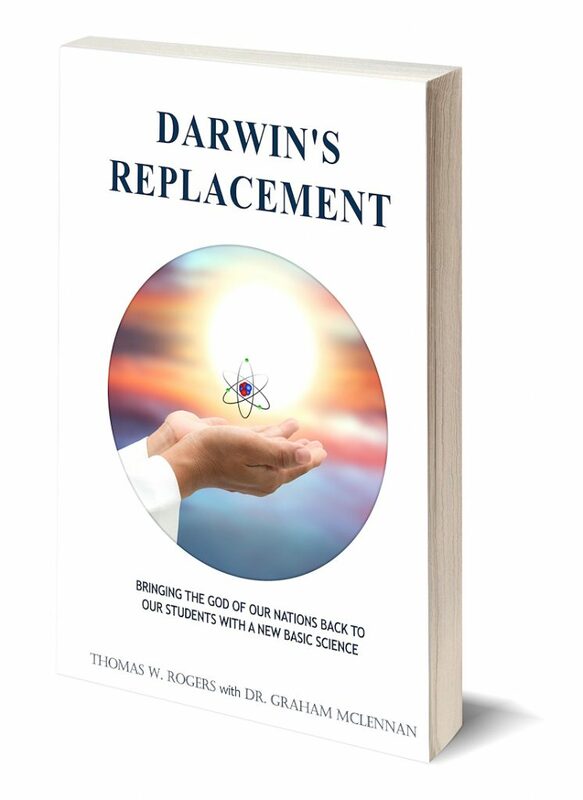 Darwin’s Replacement is the 2nd book published by author, Thomas W. Rogers with co-author Dr. Graham McLennan and the input of 43 other scholars. The focus of the book is on replacing Darwinisms with true science “going where the evidence leads.” In this case showing logical reasons why evolution is not the cause of life, but an essential super-intelligent force (God) IS. Recent discoveries have revealed the essentiality for super-intelligence (far beyond that of mankind) to construct cell-parts, cells, and ultimately, us, using atoms from our food and the air we breathe. There is growing awareness of the phenomenal complexity of living cells and the proven impossibility of an unguided process constructing them. Beyond our original 7 principles and 18 other essential works for life that evolution cannot provide, as shown in the book, a recent scientific development substantiated this position. This latest evidence was supplied through the 33 years of top level R&D by the three 2016 Nobel Prize Winners in Chemistry. J-P Sauvage, Sir J. F. Stoddart, and B. L. Feringa were awarded this Prize for constructing a few simplistic molecular machines. However, their best units are almost infinitely more simplistic than any of the molecular machines built for our new cells every day of the week. What this proves is that even with our best intelligence, sophisticated equipment, and relatively long periods of time, mankind has nowhere near enough intelligence to build even the simplest of the molecular machines needed for our cells. Therefore, evolution, by definition having no intelligence, is falsified as the cause of life. Science has worked from the top down through General Biology, Cellular Biology, and Molecular Biology, however, it seems that until now, going to the atomic level to thoroughly research the essential finding, sorting, selecting, counting, latching onto, precisely assembling, fastening, and hooking up the right numbers of the right atoms to build all cell parts, has probably been purposefully avoided. A likely reason for this is that the evolutionists currently in charge of what is taught as the cause of life, do not want to go there because the necessity for planning, prioritizing, and physically performing all those super-intelligent works with atoms cannot be performed without intelligence. When asked about this aspect of building cell-parts and cells, a typical evolutionist’s answer has been, “There are natural mechanisms that do this work.” This, however, opens up even larger problems for Darwinisms because evolution would have to build these “mechanisms” with far more intelligence and much better equipment than the three 2016 Nobel Prize Winners had. Then, of course, is the essential addition of the “Breath-of-Life” to the otherwise inanimate atoms as no cell lives without it. When this is removed, the cell no longer lives. In summary, Super-intelligence (far beyond that of mankind) is proven essential for building living cell-parts, cells, and entities, and evolution is falsified as the cause of life. The only super-intelligent force known to mankind, is the Creator recognized by the majority of our populations and governments of our nations (USA, UK, Australia, and Canada). Now “Bringing the God of Our Nations Back to Our Students with a New Basic Science” is a worthy challenge that will take the support and encouragement of many believers. If interested, please contact us through this website.